Anthony Teo discussed DNV GL’s 2018 Energy Outlook during the Liquefied Gas Senior Executive Forum in Houston which was hosted by the U.S. Coast Guard (USCG) on December 4, 2018. DNV GL’s second annual independent energy modeling outlook extended the forecast to 2050, from a forecast to 2030 in its 2017 report. In his presentation of highlights from the DNV GL modeling, Teo noted that shipping ton-miles are expected to grow by 36 percent to 2030, but then subsequent periods are flat. The outlook also anticipates an eventual decline in international coal, oil, and gas deliveries. DNV GL is the world’s largest ship classification society but also has a large consulting service. The majority (70 percent) of DNV GL’s business is related to crude oil, LNG, and coal movements. The report notes that increasing energy efficiency is the defining feature in the 2018 Energy Outlook. In its analysis, DNV GL offers separate analyses of the maritime, oil and gas, and power supply and use markets. The largest relative growth in trade is for natural gas and container cargo, for which DNV GL projects a tripling and doubling respectively by 2050. Global demand for hydrocarbons will decline after a peak in 2023 and 2034 for oil and gas respectively. 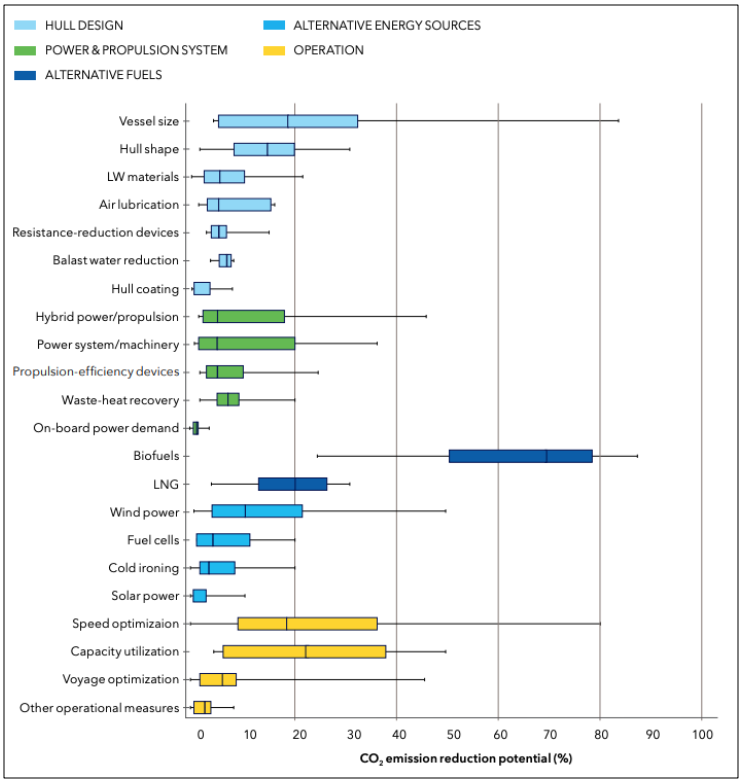 Renewable energy growth, competitive electric vehicles, and greater energy efficiency account for market-share reductions in conventional fuel use. Industrial gas demand, however, grows. Mr. Teo noted that China will become the largest gas importer by 2021, with LNG and international natural gas pipelines supplying that demand. DNV GL’s outlook for total primary energy supply, displayed below, shows decreasing supply after 2030. Similarly, as shown in the figure below, conventional hydrocarbon sources used in worldwide power generation will start to diminish in the 2030s, although total power generation is expected to grow out to 2050. The DNV GL maritime forecast projects the impacts of changes in demand. Based on this outlook, total seaborne trade grows by 35 percent by 2050. The crude oil tanker fleet will rise to 2030 and then decline (in terms of deadweight tonnes). Product tankers will decline by eight percent by 2050. DNV GL’s 2018 model finds that by 2050, 39 percent of shipping energy will be from carbon-neutral fuels, which will have overtaken the 34 percent share of liquid fossil fuels, such as heavy fuel oil (HFO) and marine gas oil (MGO). Liquefied natural gas (LNG) and liquid petroleum gas (LPG) will, together, have a 23 percent share. Electric batteries will be an energy source on one third of all ships from mid-century, providing about five percent of the total energy for shipping. The study did not identify which carbon-neutral fuels will be preferred, as this will depend on future production costs, availability, and infrastructure. Shortsea and non-cargo shipping will use 40 percent of the total energy; and, in these segments, electricity will constitute 11 percent of energy use. DNV GL first issued Class Rules for the use of lithium-ion batteries on ships in 2012. These rules cover location, fire protection, ventilation, and other key aspects for integrating a battery system. Specific testing requirements have also been developed to ensure the level of safety required in the maritime environment. DNV GL continues to push the level of safety of these systems by leading the currently ongoing Maritime Battery Safety Joint Development Project in collaboration with representatives from the entire maritime battery-vessel value chain, including the authorities. DNV GL’s Energy Transition Outlook also included possible approaches to reduce vessel emissions in support of the IMO 2050 goal. As you can see in the figure below, there is large variability in the potential of various approaches. The figure highlights the importance of biofuels made from renewable sources in substantially reducing the emissions in a cost-effective way. DNV GL’s study notes that the reduction potential for each measure strongly depends on factors such as ship type, size, operational profile, technical conditions/ status, and age. The DNV GL Outlook projects that the maritime industry will work toward reduced emissions in a competitive manner. The designs for long-lived marine vessels should anticipate the need for flexibility over their operating lives. Did you enjoy this article? Sign up for our monthly newsletter to receive insights like these straight to your inbox.